This post is a travel guide to Backpacking Bosnia Herzegovina including a one week Bosnia itinerary with the best places to visit. There are so many things to do in this small country that any Bosnia itinerary will require making some though choices. Do you need to spend more time in Sarajevo or in Mostar? What are the best places to visit in Bosnia if you only have one week? What is the best Bosnia itinerary for independent budget travellers? And why should I go backpacking Bosnia now? With this travelguide I hope to answer your questions about backpacking Bosnia and what the best Bosnia itinerary for one week looks like. Why is Bosnia the perfect Backpackers Destination? I had already visited Bosnia once in 2005 as a volunteer, rebuilding homes of the elderly that were damaged during the war. For me, Bosnia was love at first sight with its green hills and small villages. Backpacking Bosnia as a volunteer was great and since then I have always wanted to return. Bosnia is an excellent budget destination with lots to offer and one can easily spent weeks backpacking here. Sarajevo and Mostar are getting more touristic, but in general it’s still an off the beaten path destination with a lot of places that are waiting to be discovered. The nature and mountains are spectacular with plenty of thrilling things to do for those that love the outdoors. The beautiful blue rivers such as the Una and the Neretva are perfect for rafting. The mountains offer many hiking trails through forests where wolves and bears still roam around. As a bonus Bosnia is still one of the cheapest destinations in Europe. Getting to Bosnia has also become cheaper now that budget airlines have started to fly directly to Tuzla and even Sarajevo. With a one week itinerary for backpackers the focus is on Sarajevo and Mostar and places nearby that are accesible with public transport. However it would be a pity to only see Sarajevo and Mostar even though it is easy to spend a whole week in just those two places. In this Bosnia itinerary I tried to include some other places to visit in Bosnia that are easy to fit in for indepent budget travellers. It is a flexible itinerary that requires at least one week, but could also easily take two weeks. Do keep in mind that this Bosnia itinerary is far from complete. With public transport you can visit a lot of places in Bosnia, but some of them are more difficult to reach. Tourism infrastructure is still developing in this region and some of the best places to visit in Bosnia does require your own car. If you have more time you should consider renting a car. It might not be as expensive as you think in Bosnia and it allows you to explore much more of this beautiful country. A few years ago Tuzla has opened up its former military airport for budget airlines. Flying into Tuzla is probably one of the cheapest ways to travel to Bosnia. Tuzla itself is an interesting destination as one of the most multicultural cities of Bosnia and home to Europe’s only salt lake. One day is enough for Tuzla and allows you to visit the scenic old town with its colorful buildings and the salt lake that is in the middle of the center. Tuzla has always been important for Bosnia and is the third largest city in the country and a center for industry that is now having some difficult times. I stayed twice in Tuzla at an Airbnb. Our hosts were a welcoming family that had lived in Tuzla their whole life. They explained how the economic situation is getting worse. The mother used to work in Tuzla’s only hotel but has now quit her job. She didn’t receive her salary for months, something that had never happened before, not even during the war. Unemployment is high in Tuzla as many industrial factories and firms are closing down after being privatized. It was in Tuzla that a series of protests and riots started against the government that soon spread throughout Bosnia in 2014. Accomodation & Food: Tuzla does not have many hotels and therefore I used Airbnb when I was there. There are a lot of restaurants that serve the typical Balkan cuisine. Among the best of the budget restaurants are Limenka, Sezam Tenis, Makedonka, Biblioteka 45, Zlatko and Carsijska Cesma. On the way from Tuzla to Sarajevo you will find the small town of Olovo that sees few foreign visitors. This is a truly off the beaten path destination and there is in fact not much to do in the town itself. However, Olovo is surrounded by stunning mountains and beautiful landscapes that makes it a great base for some trekking in the surrounding hills where you can get a glimpse of Bosnia’s incredible nature. Olovo is in the Krivaja river valley and at the confluence of two other rivers. There are several termal springs in the area where the waters are believed to have healing powers. The Aquaterm spa in the centre of Olovo is believed to cure rheumatics and neurological problems among others. The amazing nature and landscapes remain the main draw of Olovo though. Some of the mountain paths are part of the via dinarica, a long distance hiking trail that is being developed to increase ecotourism in the region. It crosses the Dinaric Alps through several countries in the Balkans. National Geographic rated the via dinarica as one of the best destinations in 2017. I really enjoyed the small hikes we did by simply following the paths up the hill where we were awarded with beautiful views on the town below. Olovo is a safe area to walk around, but it is important you stay on the paths. Sadly, mines are still a problem if you venture deep into the forests around Olovo. Accomodation & Food: There are not many accomodation options, but some mountain huts are available on Airbnb or Booking.com. The Hotel and Restaurant Panorama next to the road to Sarajevo offers great food with a beautiful panorama view over Olovo. They also have rooms if needed. It is easy to love Sarajevo. The multicultural city surrounded by mountains that prevent it from getting bigger has a charming old town, delicious restaurants, cosy teahouses, and some interesting museums. The city itself kan keep you busy for two to three days, but you will need more time if you also want to explore the interesting daytrip options. There is so much to see and do that I tought Sarajevo deserves its own post. Please read more on the best of Sarajevo in 2 days: where east meets west.. Going from Sarajevo to Mostar is easy and the scenery along the road makes this trip worthwhile on its own. You can take an early morning train or take a bus that leaves frequently throughout the day. Both offer stunning views on the surrounding countryside. The train was a bit too early for us so we took a bus and enjoyed every minute of it. Transport: There are frequent buses between Sarajevo, Konjic and Mostar taking 3 hours. The train option seems to be seasonal and is sometimes not running. According to the Bosnian railway website the Sarajevo Caplijina express runs from June till August leaving around 7 AM and will stop in Konjic and Mostar. However, it is better to check if this information is still correct. The road from Sarajevo to Mostar is not only beautiful, but you can also make a stop at Konjic. The surrounding nature with the deep blue Neretva river is stunning. It was here, right next to the river, but hidden from view, that Titov built a bunker deep under the ground. The bunker was meant to keep him, his family and a considerable amount of other people high up in the Yugoslavian Parliament alive for two years after a nuclear attack. 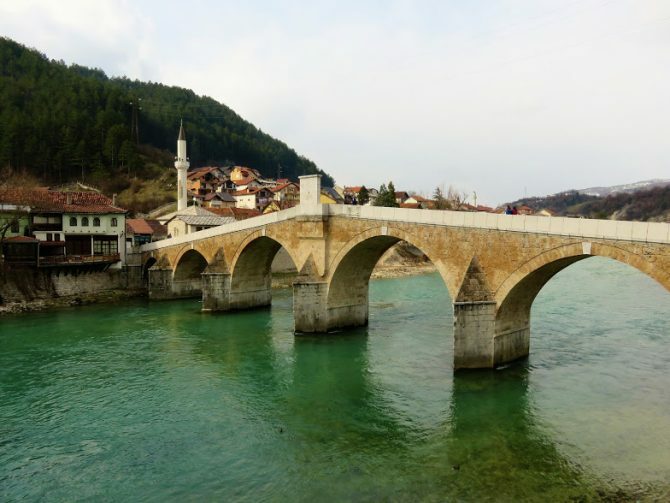 It was never used and is now open for visitors through Visit Konjic. The bunker also hosts a modern art gallery at the moment. I thought it was an interesting visit showing the remnants of a past in which nuclear attacks seemed a real possibility in some parts of the world. Any visit to Bosnia is not complete without visiting Mostar. The charming historic town with the view on the old bridge over the Neretva river took my breath away. With the excellent restoration work it is easy to forget Mostar’s gruelling past. It was however, the most heavily bombed city during the war. Most historic buildings were destroyed including the old bridge connecting the muslim part of town with the Croatian part of town. Now it feels like nothing has changed since the Ottoman times with the cobbled stoned streets and the minarets in the background. However, this is one of the most touristic places in Bosnia. I was here in the end of september when the amount of tourists was less, but I think it must be really crowded in summer. Accomodation & Food: I used Airbnb in Mostar, but there are plenty of hostels for backpackers as well such as Hostel David Mostar, Hostel Vedran and Hostel Majdas. An easy day trip from Mostar is to the small town of Blagaj where the river Buna is coming out of the mountains. There is a Dervish monastery, called a tekija, with a small museum to see how the monks once lived here. Honestly, I thought the setting was more spectacular than the monastery and mostly I enjoyed my lunch. The restaurants next to the river all offer fresh fish and a wonderful view on the surrounding mountains. All I need in suc a place is a good book and a cup of tea and I could spent all afternoon there. In fact, the local people sell honey and herbs that you can use to make tea. I bought some and when I prepared them at home they were delicious. You can either book a tour in Mostar or take the local bus. Taking the local bus is easy and it is a pleasant walk from the bus station to the monastery. Transport: bus#10 leaves almost every hour from the United World College at the Spanish square for only 2.10 KM to Blagaj from where it is a pleasant walk to the dervish monastery. Throughout my time Backpacking in Bosnia we used Airbnb and I can really recommend it. You will not only find interesting and nice places to stay, but you will also get an insight into the daily life of the people. In Tuzla we received a very warm welcome from our host family, in Sarajevo we had a whole apartment for ourselves and in Mostar we were treated with fresh home made fruit juice. With the high unemployment in Bosnia it is a great way to support local families earning a bit of extra income by offering a room on Airbnb. If you haven’t registered yourself yet on Airbnb, click here to register and you get 30 euro’s once you finished your first trip with Airbnb of 65 euro’s or more. Bosnia is one of the cheapest destinations in Europe. Even a mid-range restaurant will still be affordable for the average backpacker. If you really want to keep things cheap one of the best places to eat is a local bakery (called pekara). They specialize in Burek, which is basically filo dough with different fillings. Common varieties are with cheese (sirnica), spinach with cheese (zeljanica), butter (maslenica) and meat. They make a delicious and filling breakfast or lunch and also a good option if you are vegetarian. Another cheap eat in Bosnia is the local version of kebab called cevapcici. It comes in a pita bread with raw onions and is a great snack for lunch or dinner. Look out for a cevabdzinica that you can find almost anywhere in Bosnia. Next to cevapcici they often have other grilled meats such as pljeskavica (balkan hamburger) or Raznjici (shaslick). Unfortunately vegetarians will have a hard time to find anything to eat in such places to eat. Even though the above options are the cheapest it would be a pity not to try more Bosnian food. A so called ascinica (canteen) offers simple home made traditional Bosnian cuisine on a budget, but the quality varies a lot. For the best Bosnian food experience you should treat yourself on a visit to one of the ethnic restaurants such as Sadrvan in Mostar. Try for example dolma (meat in grape leaves) or muckalica (stew of meat and vegetables). Even though Balkan cuisine is very meat based, most ethnic restaurants have one or two vegetarian dishes on the menu. Bosnia is an all year round destination and you can go Backpacking Bosnia any time of the year. Winters can get cold, but the mountains around Sarajevo are perfect for skiing. Jahorina and Bjelasnica are the perfect destinations for winter sports. The snow makes Bosnia even more beautiful in this time. The summers in the Balkans get hot, but Bosnia’s mountains offer a welcome respite from the heat. This is the best time for outdoor activities such as hiking and rafting. Temperatures go down again in autumn when the autumn colours make this the most beautiful time to go Backpacking Bosnia. It’s a beautiful and underrated place. I hope to visit it one day and soon. Looks so much like Croatia! Definitely a country I would like to visit. Great pictures and great advice on Airbnb. Have you considered optimising your blog for mobile? thank you for sharing your advice. It is supposed to be optimized for mobile and it is on mine, but I have heard feedback from others that it is not for every mobile phone :(. I am workling on this in the future. I would love to visit Bosnia! I love the architecture in Mostar judging by your photos, and the food from the restaurant there looks delicious. It must have been a cool experience visiting the monastery too. Mostar is on my list! These Balkan countries are all still relatively untouched and feel so fresh, though they are all somewhat similar in many ways. I can’t wait to get to Mostar someday. It looks so quaint and lovely. Wow I have never been to Bosnia, but it looks beautiful. The drive from Sarajevo to Mostar looks stunning! Those views. It’s sad to hear about the unemployment rate in Tuzla. I hope things begin to look up for the community of Tuzla soon. Mostar looks lovely and well worth visiting. Thanks for sharing. I had only ever heard of Sarajevo before! I had no idea there were so many beautiful places to see Bosnia! Bosnia looks gorgeous! I really can’t wait to get myself over there! Any must see sights that I shouldn’t miss? Bosnia looks like a fun place to explore. How was the food and the people? Your international volunteering is inspiring! What a great way to see the world and give back! Thank you for the well written blog. Great place, not too crowded with tourists yet. The mountain side monastery looks gorgeous. I will look into how Airbnb works, thank you for the tips. I still have to visit Bosnia, but my other half did, and as you said, he loved it. He loved Mostar and he loved Sarajevo. So I have to go and visit. I had a psychology lecturer at university who would wax lyrical about Bosnia. He said it was somewhere everyone should visit once in their life, after reading your post, I might have to agree with him. My friends visited Sarajevo and Mostar last summer and were blown away. Sadly lots of people still associate Bosnia with war but it is definitely moving onto people’s radar. It must have been so interesting to see the change since the last time you visited. Many people when they hear about “Bosnia,” the first thing that comes to their mind is a war-torn country referring to the armed conflict between Bosnia and Herzegovina in the early 90s. We’re glad that we are more open-minded. What a scenic place! This is a great place for backpacking. We wouldn’t mind sitting all afternoon having a latte on those quiet streets. The river scenes are simply awesome! You are right, Bosnia is Europe’s best kept secret! It looks like a delightful country. Mostar looks so beautiful and the food sounds like its really good. If it is anything like Montenegro then we know it truly is good! Curios to know what Bosnia’s traditional cuisine is and what your picture of food is. It’s always interesting to return to a place you already been to. Bosnia is on my list for this year too so it was great to see a glimpse of what life is like there. I usually opt for Airbnb too. I love how it helps out families while giving you an authentic look at a culture. My travel partner and I have a whole list of countries we want to see when we move to Europe. Bosnia was on the list but after your post, I think it got bumped to the top! How beautiful! Oh, this is bringing back such happy memories of my time in Bosnia! The people were so kind, the scenery was so beautiful, and the food was pretty good too (even as a vegetarian!). Hopefully I’ll get to visit again in the future! We loved our time in Bosnia but only went to Mostar. Will need to go back. Thanks for sharing.